Most of the entropy in materials comes from the vibrations of atoms. This vibrational entropy depends on the frequencies of phonons, or lattice vibrations, which change with P and T. Knowing the vibrational frequencies is essential to understanding the Gibbs free energy at elevated P and T. Usually the frequency of a phonon mode is assumed to change linearly with P or T, but these linear relationships are obtained near ambient conditions. Such theories are called "quasiharmonic" (for variable P) or "anharmonic" (for variable T). In more extreme environments with wider ranges of P and T, departures are expected from these linear behaviors, and geophysics offers many examples of this. 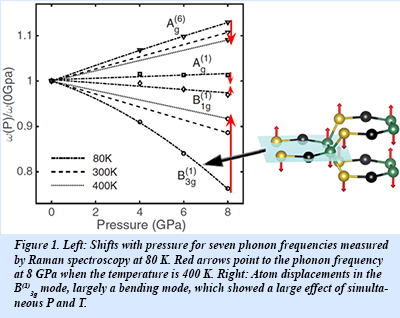 In an experimental collaboration between the Fultz group at Caltech and the Strobel group at Carnegie, Raman spectra were measured on the new clathrate structure of silicon, Si24, which has a nearly direct band gap, and may be altered by P and T. A significant shift in the phonon frequencies was observed with changes in P from 0 to 8 GPa, as shown in Fig. 1. Surprisingly, these frequency shifts with P are markedly different when temperature is changed from 80 to 400 K, as shown by the red arrows in the figure. The frequencies of seven Raman modes at different P and T were analyzed to reveal a large contribution from the product term dT dP for the B(1)3g Raman mode (shown at right in the figure). In fact, over the modest range of dT = 320 K and dP = 8 GPa, this product term gave the largest frequency shift of the B(1)3g mode. The important result of this work is that thermodynamic effects of simultaneously elevated P and T can be studied at the level of individual phonons. A full understanding of the thermodynamics of materials at extreme P and T, however, requires information on more than just a few phonon modes. Future work will assess the full phonon spectrum to evaluate effects on the Gibbs free energy in extreme environments [X. Tong, et al., Phys. Rev. B 95, 094306 (2017)].